Colder Products PLCD24004 quick disconnect coupling. Ideal for disconnecting a water filter or humidifier running hot or cold water. This coupling connects with all the Colder Products female couplings that we offer. The threaded end of this coupling has a male 1/4" NPT (National Pipe Thread Tapered). A 1/4" NPT has an 0.54" OD with a tapered 18 threads per inch. This coupling will screw in to either end of the MicroPlus Series housing. It will be necessary to use a pipe thread sealant tape. All our couplings have an internal valve that automatically shuts off the water when disconnected. It is not necessary to shutoff the water supply when disconnecting these couplings. When disconnecting a water filter or humidifier, the water will not leak out of either end of the connection. Our	Colder Products couplings require purchasing both a female coupling body, and a male coupling insert. 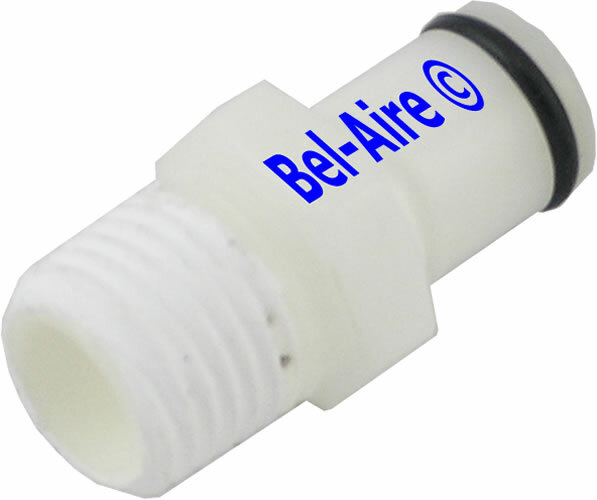 and valves: Acetal, resistant to common water supply chemicals, chlorine, fluoride, etc. Colder Products Company manufactures many products specifically for the Food & Beverage marketplace. All of these products are listed under NSF/ANSI standard 169 and are made from FDA approved materials. Visit http://colder.com/nsf to learn more. Applications may include: water filtration, humidifiers, office coffee service, food service equipment, etc. Colder Products Company is the leading provider of quick disconnect couplings and connectors for plastic tubing. Founded in St. Paul, Minnesota in 1978. All Colder products are designed and manufactured at their facility located in St. Paul, Minnesota.